What Drives Business Process Change? What Does a BPM Group Do? The Initial Cut: What is the Process? Why Use Business Process Software? What Features Might a BPM Suite Include? 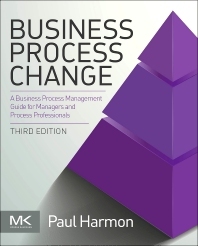 Business Process Change, 3rd Edition provides a balanced view of the field of business process change. Bestselling author Paul Harmon offers concepts, methods, cases for all aspects and phases of successful business process improvement. Updated and added for this edition is new material on the development of business models and business process architecture development, on integrating decision management models and business rules, on service processes and on dynamic case management, and on integrating various approaches in a broad business process management approach. Paul Harmon is a cofounder and executive editor at Business Process Trends, an internationally popular website that provides a variety of free articles, columns, surveys and book reviews each month on trends, directions, and best practices in business process management. He is also a cofounder, chief methodologist, and principal consultant of BPTrends Associates, a professional services company providing executive education, training, and consulting services for organizations interested in understanding and implementing business process management. At the same time Mr. Harmon serves as a Senior Consultant for AI with Cutter Consortium.